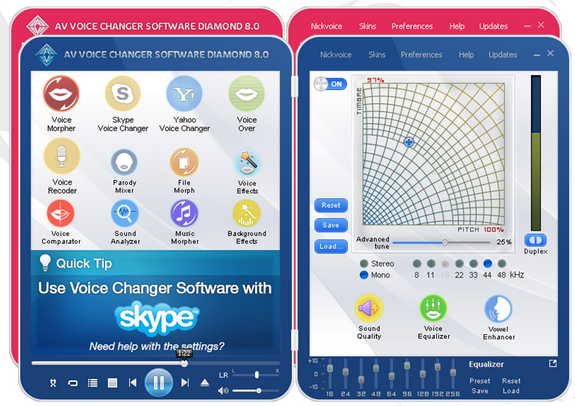 Voice Changer Software Diamond 8 - The Smartest Voice Changing Tool! AV Voice Changer Software Diamond from www.audio4fun.com has been upgraded to a new level with cool new look and more advanced voice changing settings for the most natural voice - AV Voice Changer Software Diamond 8.0. Just like other voice adjusting program, AV Voice Changer Software Diamond version 8.0 offers users the ability to change their voice tone. It's dedicated to voice changing for online and local computer-based tools. Let's have a quick review to find out the reason why it's leading voice changing technology at the moment. AV Voice Changer Software Diamond version 8.0 features a cool look with 2 main panels. This upgraded program has 2 skin colors: blue skin inspires you with professional, cool feeling while pink one shows a softer and more playful aspect. Furthermore, two main panels including "Remote" module on the left, "Main Function" module on the right are also new additions in order to help you easily control and monitor every single activity. The biggest difference in AV Voice Changer Software Diamond version 8.0 is definitely the timbre and pitch graph which is also called Voice Morpher graph. This program introduces to user a superb voice changing algorithm with curved line graph bringing a completely different feeling. With hundreds of propeller shapes having various areas, every arching set point offers the ability to change your voice tone more smoothly and flexibly in real time. Advanced voice changing settings such as Sound Quality, Sound Quality, Vowel Enhancer and Equalizer are not only improved to be clearer and more effective for morphing processes. All of them are now featured in the same panel so that user can easily control every single activity and always produce output voice in the best quality. Vowel Enhancer to change an amount of harmonics to fix out-of-tune notes or change key of singing voice without affecting timbre and pitch, and the full. 10-slider Equalizer to control the strength of the sound quality with a host of presets for easy and instant selection. AV Voice Changer Software Diamond version 8.0 now offers you a wide variety of sample output voices (a.k.a. "nickvoices") for user's creative choices. Your voice can sound like a lady, a gentlemen, a baby, an alien or a devil, and even like popular characters from blockbuster movies you've ever seen. With up to 50 different, unique "nickvoices", changing voice will be easier and faster than ever before. Let's begin a new journey discovering AV Voice Changer Software Diamond 8.0 and experiencing the most professional voice changing technology!